High Quality Content by WIKIPEDIA articles! 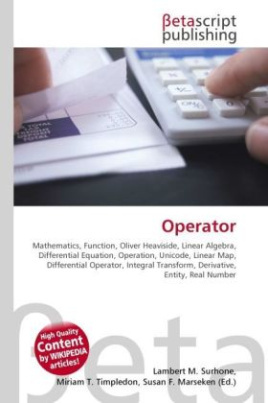 In mathematics, an operator is a type of function. Often, an "operator" is a function which acts on functions to produce other functions (the sense in which Oliver Heaviside used the term); or it may be a generalization of such a function, as in linear algebra, where some of the terminology reflects the origin of the subject in operations on the functions which are solutions of differential equations. An operator can perform a function on any number of operands (inputs) though most often there is only one operand. An operator might also be called an operation, but the point of view is different. For instance, one can say "the operation of addition" (but not the "operator of addition") when focusing on the operands and result. One says "addition operator" when focusing on the process of addition, or from the more abstract viewpoint, the function +: S×S S.